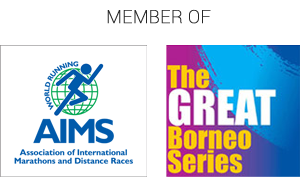 Kuching Marathon (hereinafter referred to as “KM”)/(the event) is organized, promoted and owned by Kuching Marathon Association (KMA)/(the Organiser); a sport body registered under Sports Development Act 1997. 2.1 Category of Full Marathon of 42KM – 18 years and above. 2.2 Category of Half Marathon of 21KM – 16 years and above. 2.3 Category of 10KM Run – 15 years and above. 2.4 Category of 5KM Run – 07 years and above. Participants below the age of 18 years are required to obtain parental/guardian’s consent and are to complete the relevant indemnity declaration form as deemed necessary by the Organiser upon registration, failing which, the Organiser reserves the right to refuse entry to any applicant under the age of 18. A participant is considered a veteran if his/her 45th birthday falls on or before the race day. 3.1 to collect, analyze, collate, share, disclose to third parties, sell and/or otherwise use without any liability to the individual, any personal information relating to that individual as may in its sole discretion deem fit, including without any limitation for its programmes, planning, data- processing, and statistical or risk-analysis, research, fund-raising and/or any other purposes in furtherance of the functions. The Organiser and the sponsors declare by virtue of being the event owner or sponsor, they can use services of third parties. 3.2 to post the full race results on KM’s website after the race. 3.3 to use any photographs (including those of participants), motion pictures, recordings, or any other media records of KM, for any legitimate purpose including commercial advertising and distribution to Sponsors anywhere in the world. Registration for the race is only confirmed upon full payment made and upon issuance of a race identification number. Registration fee payable and courier charges for delivery of race pack for the event shall be subject to payment of tax imposed by government, if any. In consideration of the participant’s use of the KM website, the participant agrees to provide true, accurate, current and complete information about the participant contained in registration form. If at any point of time, the Organiser has grounds to believe that such information is untrue, inaccurate, obsolete or incomplete, the Organiser may suspend or cancel the participant’s registration without any refund of registration fee. The Organiser reserves the right to cancel KM at any time without prior notice to the participant, in which case such cancellation will be informed to the participant before race day. If KM has to be cancelled due to occurrence of incidents that are beyond the control of the Organiser and which renders it impossible or unsafe to hold the event including but not limited to force majeure, there shall be no refund of fees paid and the Organiser shall not be liable for any direct or indirect loss or inconvenience caused arising of the cancellation. The Organiser reserves the right to amend KM race routes as they deem fit for the safety of the participants and/or to prevent any potential hazards in the running of the event, at any time without prior notice to the participants. For race route amendment, every effort will be made to inform the participants prior to the race day. The Organiser shall not be liable for any loss or inconvenience caused due to such amendment. Whilst every reasonable precaution be taken by the Organiser to ensure the participants’ safety, participating runners run at their own risk. The Organiser shall not be held responsible or liable for any injury or death arising from training in preparation for the event and/or participating during the event. Participants are strongly encouraged to go for medical check-up and/or in consultation with their medical practitioner prior to registration and/or at any time from the date of registration till race day to satisfy himself/herself of his/her mental and physical fitness in participating in the event. The form on the reverse side of the participants’ bib number must be completed in full and accurately. Participants must wear the assigned bib number on the front of running vest/t-shirt. Participants who are not wearing a bib number and/or who failed to wear a bib in a visible manner will be taken off the course by officials/marshal of the event. 10.1 Partial road closures on the Full Marathon Route will be completely lifted after 7 hours from commencement of the race (cut-off time). Cut-off times will be set at specific checkpoint(s) along the route (“Checkpoints’ cut-off times”) and will be strictly enforced to ensure the safety of runners who are unable to complete the race within the 7 hours and to ensure that the roads can be re-opened to the public in accordance with the requirement of authorities. 10.2 Partial road closures on the Half Marathon Route will be completely lifted after 4 hours from commencement of the race (cut-off time). Cut-off times will be set at specific checkpoint(s) along the route ("Checkpoints’ cut-off times") and will be strictly enforced to ensure the safety of runners who are unable to complete the race within the 4 hours and to ensure that the roads can be re-opened to the public in accordance with the requirement of authorities. 10.3 If you do not reach the specific checkpoint(s) within the stipulated Checkpoints’ cut-off times, officials will disqualify you and ask you to board the bus or such other vehicles arranged by the Organiser to be ferried back to Padang Merdeka. A participant must retire from the race immediately, if instructed to do so by any member of marshal, medical personnel, Jabatan Kesihatan Negeri Sarawak, Jabatan Pertahanan Awam Malaysia (JPAM), Jabatan Bomba & Penyelamat Negeri Sarawak, Malaysian Red Crescent Society, St John Ambulance Sarawak, Polis Diraja Malaysia, Rejimen Pertama Kor Polis Tentera Diraja, Markas Divisyen Pertama Infantri Malaysia, Rela, Dewan Bandaraya Kuching Utara, Majlis Bandaraya Kuching Selatan, Persatuan Olahraga Amatur Sarawak (SAAA), referee, Event Director and/or any official authorised by the Organiser, failing which his/her bib number will be recorded and he/she will be removed from the race, from this point onwards he/she will be continuing independently of the event and at his/her own risk. Pets, bicycles, tricycles, in-line skates, prams, push carts, shoes with built-in or attached rollers and any other wheel-run objects and any form of support vehicles are strictly not allowed on the race course other than official and medical vehicles unless with prior written permission from the Organiser. Once registration has been duly processed, there shall be no refund for whatsoever reason. The Organiser reserves the right to limit and/or refuse entry without giving any reason and/or notice. The Organiser shall not entertain nor be in any way responsible for any disputes, discrepancies or complaint arising from incomplete or inaccurate entry details in the registration form. The Organiser reserves the right to cancel, vary and/or add any race category without giving prior notice. A participant who commences to run before the starting time of his/her registered race will be disqualified. Participants who do not start within 15 minutes from respective flag off will be disqualified and for safety reasons may not be allowed to start. The Race Pack collection dates are 09, 10 and 11 August at Plaza Merdeka, Jalan Tun Abang Haji Openg, Kuching, Sarawak, Malaysia, and subject to change. 23.1 Prizes for winners are as stated in the prize list on the KM official website. They are subject to be changed, restructured or cancelled at any time by the Organiser without giving any reason and prior notice. 23.2 The “Gun Time” shall be considered to determine the winners for all categories. 24.11 All finishers who have successfully completed the event within respective category’s cut-off time will receive a certificate of participation which can be downloaded online within two weeks after the event. 24.12 Unless and until the participants have successfully completed the event within respective category’s cut-off time, the participants shall not be entitled to finisher’s medal, finisher T-shirt (for Full Marathon 42KM and Half Marathon 21KM only) and certificate of participation in which event the Organiser reserves the rights not to entertain any request for finisher’s medal, finisher T-shirt (for Full Marathon 42KM and Half Marathon 21KM only) and certificate of participation. 24.13 Subject to the rules and regulations stated herein, the payment of registration fee does not automatically entitle the participants to finisher’s medal, finisher T-shirt (for Full Marathon 42KM and Half Marathon 21KM only) and certificate of participation. 24.14 The Organiser shall not be responsible for any loss and/or damage to the belongings and items deposited at the Drop Zone counter provided for the Participants. Participants are advised to leave valuables at home and to bring as little as possible with them as space may be tight on the race day. Bags are checked in at owner’s risk. The Organiser also reserves the rights to check any item or bag deposited. The timing chip is a single-use, disposable item. Proper placement of the timing chip is extremely important and the timing chips have a 99% average read success during most races. And while every care is taken to ensure that the timing chip is of working order when given to the participant, the Organizer shall not be held liable in the small chance when a timing chip does not have a successful read after the race. No refund or consolation will be given to the affected participant(s). The Organiser reserves the right to unilaterally add on, modify or substitute any of the above rules and regulations of KM at anytime as they deem fit without prior notice. If there is ambiguity in any of the provisions, the Organiser shall be the sole authority which has the absolute, full, final and complete power to interpret it as they deem fit. By participating in the event, I have read and understood the rules & regulations and I agree to participate on the understanding that, I must adhere to ALL the rules and regulations stipulated. WAIVER CLAUSE : In consideration of the acceptance of my entry, I, my heirs, successors and assigns, do hereby unconditionally and irrevocably waive and release the organizers, the event sponsors and partners as well as all persons, servants, contractors, agents, service providers, volunteers and agencies connected with it from all complains, demands, claims, liabilities, proceedings, suits, losses and/or damages of any kind whatsoever due to or relating to or arising directly or indirectly out of my participation in the event, including without limitation, personal injury and/or death.